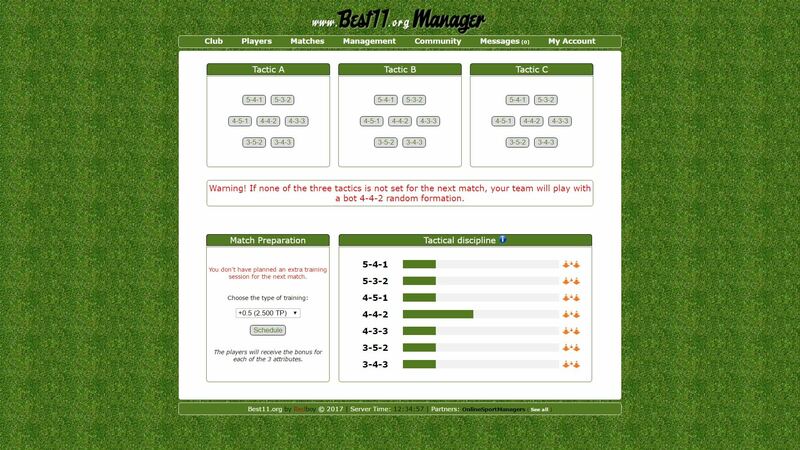 Best11 Manager is a free online football manager game with plenty of challenges. Manage your club, improve skills, join competitions, handle your finances, define your own strategy and win rewards. You can create up to three different tactics and switch your strategy according to the opponent. You should consider signing the sponsorship contracts as the sponsors are one of the most reliable sources of income. Notice that sponsorship contracts are valid till the end of the season. Find the greatest players with big talents and train your team to reach the top. Some advantages are only available for premium players. season. I dont know if anyone has been banned. Old-Schooler (in game username: SamohT) is just frustrated because I’ve banned him on the forum. However, he still plays the game, and no, I didn’t banned his account. Actually, I didn’t banned one single account just because someone disagreed with me. This is just a stupid lie. If you decide to join the game… Enjoy! The developer has stated that he won’t continue to improve the game. The game has a very small player-base, and the game offers almost no gameplay. Despite the things mentioned above, the developer has banned and deleted multiple accounts because they disagreed with him in public about implementations he made to the game. I highly do NOT recommend this game to anyone.